Superjet – Down but not out? Experts are divided over the prospects for the Sukhoi Superjet 100 after the tragic crash in Indonesia. Since Russia’s most advanced new aircraft, the Sukhoi Superjet 100, crashed in Indonesia, experts have been asking if the accident heralds disaster for the entire Russian aviation industry or if the Superjet project can overcome the crash’s bad publicity. One of the main questions that aviation specialists have been asking themselves is how the plane, filled with state-of-the-art electronics and guided by the best test pilots, could have missed a mountain. The Superjet uses all the latest global security innovations, in particular the traffic collision avoidance system (TCAS) and the terrain awareness and warning system (TAWS). Related: Jet crash caused by human error? Aviation specialists have wondered whether the local controllers did their best. Some pilots claim that both in Indonesia and the Philippines controllers say “Approved” in response to almost any call from the crew. “I am also concerned that there have been seven plane crashes near Jakarta during the last decade,” Aptukov said. So far, there are only unofficial versions of what happened. The official report will appear only after the Indonesian authorities, the Russian Industry and Trade Ministry (supported by the Foreign Ministry), Investigation Committee specialists and experts of the Interstate Aviation Committee (MAC) complete their investigation. But there is no prospective date for the issuance of the official report, as Indonesian salvage teams have said that accessing the crash site is extremely difficult due to the terrain. This will make it harder to recover both large pieces of debris and smaller parts of the plane. Without these, it will be hard to gain a real picture of the tragedy. In the best-case scenario, the official version will not be ready for several months; in the worst case, the world may never learn what really happened to the plane. Globally, the market for medium-range aircraft is the most competitive, and the Superjet was intended to vault Russia to the top of that segment. In the aftermath of the crash, Russian aviation experts and foreign buyers alike are reassessing Russia’s prospects. The investigation into the disaster had hardly begun when Indonesia’s Kartika Airlines, which specializes in domestic air travel, said it might postpone indefinitely its order for 30 Sukhoi aircraft. Kartika was the first company in Southeast Asia to buy the Superjet; it placed a $951 million order in July 2010. The first deliveries were expected in September. Sky Aviation, another Indonesian air carrier had reached an agreement to buy 12 Superjets, It has not yet commented on the status of its order, but experts are certain its response will be identical to that of Kartika. As of today, hard contracts are in place for the delivery of 168 jets to Russian and foreign air carriers and there are preliminary contracts and agreements of intent to buy about 130 Superjets from carriers in Spain, the United States and Thailand. Experts are divided over whether these contracts will be cancelled or whether the carriers will deal with the fallout of the crash in a different way. Air carriers are normally very pragmatic. If an airplane has a type certificate, then there is sufficient proof that it meets all security standards. 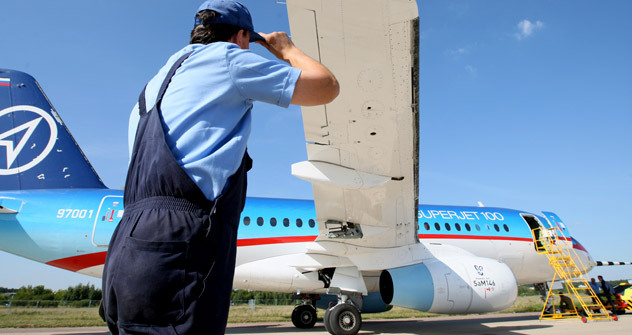 In February 2012, the Sukhoi Superjet 100 received the Type Certificate from the European Aviation Safety Agency (EASA), meaning that it complies with the standards that all alternative producers have to meet. Another important reason the contracts are likely to hold is that Sukhoi currently supplies the most competitive medium-range aircraft for domestic operations. Small as it might be, the Superjet has an impressive range. It falls just out of the regional class, with a capacity of up to 100 passengers and range of 4,500 kilometers, which is why Sukhoi Civil Aircraft believes that most of the demand for its jets will come from Southeast Asia. Distances are huge between islands in the region, which means that the Russian Superjet will be a welcome option for local carriers. Secretary General of the Indonesia National Air Carrier Association (INACA) Tengku Burhanuddin has already stated that the crash would not affect the demand for this model. “We need such planes to connect our cities,” he said. Sukhoi’s competitors in this market segment, most of which are still in development, are generally more expensive. They include Brazil’s Embraer E-Jets (priced at $28.5-40 million), Canada’s Bombardier CSeries ($58.28-66.57 million), China’s ARJ21 (price not disclosed yet), Russia’s An-148 ($24-25 million), Tu-334 and Japan’s Mitsubishi Regional Jet. The crash has produced an adverse impact on the image of the brand; yet many specialists argue that accidents of this kind have happened to many international producers, which managed to deal with the trouble with their heads held high and pride intact. This article is abridged and originally appeared in Itogi. It can be found in the original Russian here.